Aadhaar Linked Digital Locker Goes Live. Here Is How To Securely Store Documents Online! Having issued Aadhaar cards to a majority of the Indian population, the Indian government now wants to make the best use of them. Back in November 2014, the government had proposed a ‘Digital locker’ concept. The locker, it was proposed, would be linked to the Aadhaar card of citizens and would then enable them to store all their government issued documents (right from birth certificate to degrees) on the cloud storage system. The documents thus stored in the digital format can be accessed by the users of the facility by using their Aadhaar numbers. The department of electronics and information technology has now rolled out a beta version of the ‘digital locker’ which is being labeled as one of the most ambitious aspects of Prime Minister Narendra Modi’s Digital India programme. To use the digital locker, users need to create an account at its website using their Aadhaar card, or unique identification (UID), number. The ultimate aim of the digital locker scheme is to place all educational, medical, passport and PAN card details of every Indian in a digital form over a cloud storage system so that he can access them all from anywhere in the world without having to carry all the documents physically. The service has been rolled out only in the beta version so far and before the government goes ahead with the final implementation of it, they hope to invite public feedback on the concept and its implementation. The department of electronics and information technology (DeitY) has invited comments from users on the government’s idea crowdsourcing platform myGov.in. Doubts had been raised about the security of the documents thus stored but R.S. Sharma, secretary, department of electronics and IT, assures that the system is totally safe. A senior C-DAC official who has been involved in carrying the project further said that the security concerns should not be a hindrance. Assuring that the safety option features data encryption of the highest level, there would be no threat to the confidentiality or the safety of the data so stored. The data will be protected by a One-Time Password, which will be sent to the user’s mobile via an sms every time he tries to log in to his digital locker, much in the same manner as an online banking transaction at present. There is no issue of government scrutiny because the certificates stored are issued by the government departments, he assured. 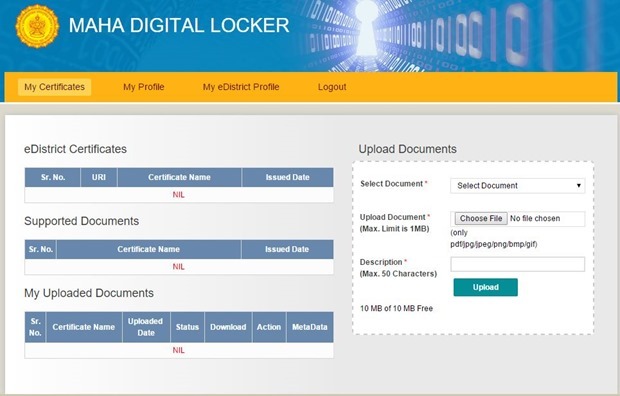 The Maharashtra government has taken the lead in this regard and has introduced the “Maha Digital Locker”. Anyone in the state of Maharashtra who has an Aadhar card can use the e-locker facility by logging in on elocker.maharashtra.gov.in. Whenever a person will apply for a document or a certificate at any SETU (project) office, a copy of it will be uploaded by the Gram Panchayat, Tehsil or collectorate office, said Virendra Singh, Director of IT department of the State Secretariat. You can start using the digital locker immediately – First login to their site http://digitallocker.gov.in/. It will ask you for Aadhaar number along with captcha. Once you enter the number, your registered mobile number and email ID will get a One Time Password. 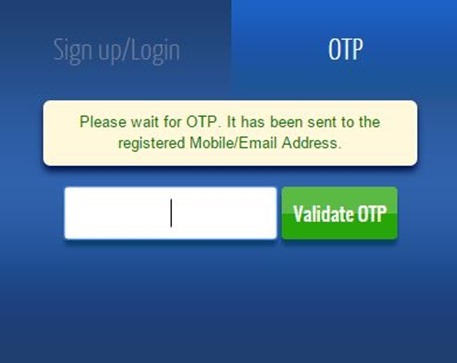 Enter the OTP and you can see following dashboard, through which you will be able to upload your documents. You can choose from the list of documents through the drop-down menu available. We successfully uploaded our PAN card. Interestingly, you can directly share your documents from your to any email address that you want. You can also e-sign the uploaded document which will in future be used as official digital signature on documents. Over all, we think it is a great move to introduce Digital locker. It is sure to help millions of Indians to keep all their documents safe. The biggest negative aspect of Digital locker is that it offer only 10mb space for all your documents. This is too limiting and will be difficult to accommodate all documents in such less space. The Digital locker uses the same security that all banks use for internet banking. They use your registered mobile number and email address to send you OTP. That is the only way you can gain access to digital locker. It is not clear how the State Govt and Central Govt digital lockers will integrate with each other. 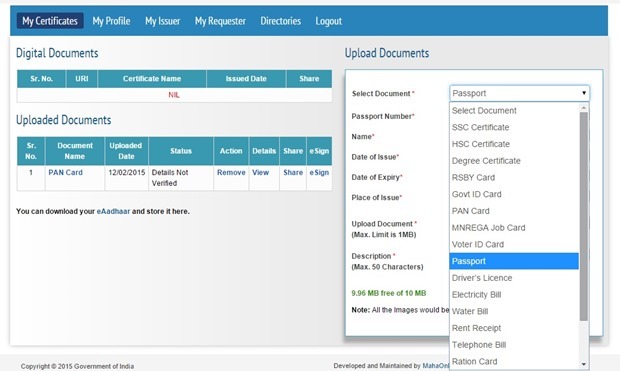 When we tried using the Digital locker rolled out by Central Govt, we were able to successfully upload our documents and certificates (see above screenshot, we have uploaded the PAN Card.). However, when we logged into Maharashtra Digital Locker system, the same uploaded certificates were not seen. We had to go through entire process all over again. Maharashtra State Digital Locker system also has 10MB space limitation, but they have an extra layer of security, where they also ask for a PIN number in addition to OTP. We will be testing out the system over next few days and get back to you with more details. Flollowing these steps automatically diverted me to “https://digilocker.gov.in/public/register” with error message as “Try Again! You are doing something wrong.” and asking to provide aadhar card number again. Does everyone observed this. Both url looks similar but are different. “digitallocker” vs “digilocker”. Not sure if one of them is some kind of fraudelant website. On “digilocker” website it accepted aadhar card without error and asked to provided OTP. I did not went ahead after this. i try to create the account of digital locker but do not acept my addar no. when i sign up digital locker my Aadhaar no then OTP not received, but mobile no already register link up with Aadhaar card. any one help me…. Is there any problem going on with the digital locker as i am unable to create. Its gives me error Invalid Request. Please send the request according to the specification requested. This is supposed to be SECURE,why is it on HTTP and not is HTTTS ? 01 are our govt babus ready to accept the documents printed out from the locker without the attestation etc. Our babus and sub babus are too good in creating hurdles rather than assisting the public. 02 Our support system is in a mess. For example i want to change my mobile no with UID. This is the third year running unable to do so. Send mail to the UID officials. Handed over the printed service request form nothing has happened. Because of non update of the mobile no, the basic requirements are not being utilized. I call upon the officials to put the support systems in place in order to popularize. The BSNL internet is also decently bad. The speed is erratic. Any amount of complaint does not guarantee to set right the issue. In the era of super fast, complaint at BSNL gets attended after 24 hours, Saturday and Sunday is off. In such a pathetic services, how can the country move towards the digital dream!!!!! I realy very like digital locker and digital locker protact my documents and we are realy happy for e locker and its facility is very cool. i want to tell i will last person to save my docs on this site. I have uploaded all my documents, in fact all documents of my family members to my email id. And additionally I carry a pen drive with all data stored therein. It is in fact easier. I do not know how the digital locker facility is going to add to the comfort level of the Indian People. Digital attestation might be helpful. Being project of GOI, security of personal data would always remain questionable. So, where are all our talented hackers?! I would like to open my digital Locker. Please guide in this regard. I would like to open my digital Locker. Please guide. It must have to be secured through HTTPS but not through HTTP. I used to upload my own documents after scanning them to my own mail and access them anywhere. How is this service any different. HTTP based URL even for a Beta version simply shows how seriously this product has been launched. Saving public documents just on the cloud doesn’t make them safe. This is not clear how will the Indian population that has no internet will first scan the document/take a photo of their document and then go to internet to open a website in order to save their document. Government can easily reach out to masses and encourage public to come to post office etc to upload them. I have made an attempt with eDakia (http://www.edakia.in), an end to end complete solution of scan and upload the document on cloud based on User Mobile Number using Canon scanner, tablet, with easily deployable kiosk on any retail store. This solution helped to save, store, share your documents anytime anywhere to anyone on their mobile or on any email address. We basically tried empowering Indians to use email like service using their mobile numbers only. Didn’t get much traction as it was not backed by Government or any investor but good to read Government is looking into this concern and heading towards solving this issue. This is supposed to be SECURE, then why is it on HTTP and not HTTPS? The facility is cool, it will be better when e-sign facility will actually start working. But there is also a fear that unauthorized officials or govt. agencies can misuse the docs for their own purposes. Also there is a lack of security as there is no registration or log-in facility currently available. But the product is still in beta,I hope that the Govt. add the necessary features in it in future. This is a very good initiative and will surely be very useful. Another feature could be added to Digital Locker like Digital Attestation of docs. There are many scenarios, like for students where they have to submit attested documents to university for admission. Instead of getting them attested from Gazetted officer or Notary (by paying money), this system can be used for digital attestations and sharing the document in a secured way digitally/online. But this should be accepted in universities, colleges and educational institutes across the country. There are lots of lags in the project. First- As above mentioned the Central Government Locker and State Government Locker do not have any inter communication. Second- It is a well known factor that Indian public hold a lot of fake documents too for example, multiple PAN Cards, multiple Election Voter ID cards. The entire system can be integrated to make a secure background check on the person too to identify the fake document holder. 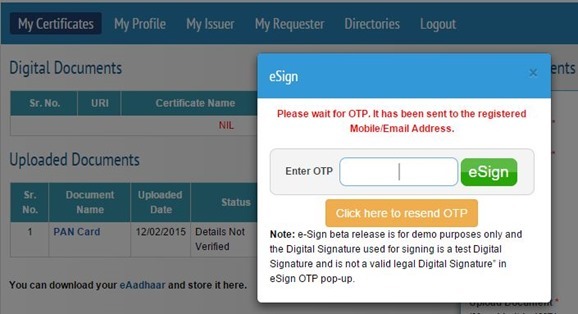 Third- The E-sign feature is only valid when all Government offices are meant to accept it. Without that its waste of technology. Fifth- You need to establish an entire separate section of people dedicated to upload the details in the peoples’ account for which they are hiding. For example- if a person has updated Aadhar card, Education certificates but not the PAN card because the person has multiple ones and is trying to hide it out. So there could be team who can pull out the records from other databases with the help of already uploaded documents and identify the PAN card number too and update it. Which will in turn help all other agencies of the Government too. Ravi Shankar’s problem is not clear. The originals of documents will be with you and only pdf or gmf formats of the documentws will be in the locker. then how will it be least. at the same time I agree your documents can be hacked and your personal information will be revaealead.